Collards were chosen as a 2019 Mississippi Medallion winner because they are considered absolutely necessary for true Southern cuisine. As a bonus, they’re really easy for home gardeners to grow. Collard greens, known botanically as Brassica oleracea, are multipurpose vegetables for Mississippi gardens. We grow our best collards in the fall, through winter and into spring. This makes sense as collards don’t tolerate high temperatures very well, but they appreciate cooler weather, even frost and freezes. In fact, the cold intensifies collards’ flavor profile. in 50 to 75 days. I wouldn’t worry about the bitterness aspect too much. Cooking them down with a little – or a lot of – bacon or ham will certainly make them taste good. Dr. Gary Bachman is an associate Extension and research professor of horticulture at the Mississippi State University Coastal Research and Extension Center in Biloxi. 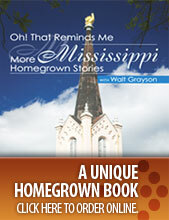 He is also host of “Southern Gardening” radio and TV programs.